She’s a cool drink of water, Angela Lansbury is. 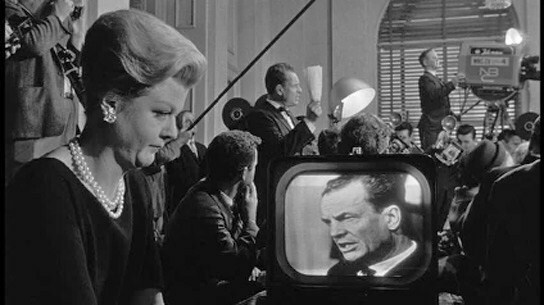 In the 1962 thriller The Manchurian Candidate, Lansbury plays the shrewd wife of bombastic political candidate (James Gregory), a man who cannot conceal the fact that he’s an idiot. Having a moron for a husband is a minor consequence for Lansbury. In fact, she needs a moron if she’s going to scheme her way into the White House. It doesn’t matter who the moron – er, husband – is, as long as he can take direction. The Manchurian Candidate stars Frank Sinatra as a U.S. Army veteran, recently retired from the Korean War. Sinatra’s character is a broken man – he cannot sleep or concentrate on his work because he suffers from recurring nightmares. These nightmares always revolve around a strange event that may or may not have happened during his tour of duty. It’s only when Sinatra reconnects with his superior officer (Laurence Harvey) that he begins to piece together the events in Korea, and what they might mean for the United States. Meanwhile, Lansbury (who is also Harvey’s mother) continues to drag her poor slob of a husband towards the White House. Because her son came home from Korea a decorated war hero, she’s determined to use him as a prop in her husband’s PR campaign. In this film, Lansbury is a cool, neatly-pressed blonde, with a severely-sprayed ‘do and classic strand of pearls. She is very First Lady-ish, if not downright Presidential. Even in this harshly-lit film, she is stunning in her tailored tweeds. She’s every bit the Movie Star. And every bit the Villain. Lansbury is a Take Charge kind of Villain. She either barks out orders or softly cajoles you into compliance. She smiles and gently presses your arm as though she were your best friend – or she snaps you in two like a brittle cookie. She’s a detonator, this one. But in most scenes, Lansbury is calm, regarding others with with thinly-veiled contempt. Her expressions reveal the work it takes to drive a fool in politics. In one scene she loses patience with Gregory. “You’re going to look like [an] idiot if you don’t get in there and do exactly what you’re told,” she shouts. Gregory, a seasoned political candidate (and a grown man), whimpers like a kicked puppy. Control of the White House! Power! Martial Law! Is this a villain, or is this a Villain? Here is a woman capable of hijacking an American election and making it look like an act of democracy. Villains don’t get any more cunning than this. Single-handedly getting an idiot elected to the White House. Breaking up romances if they’re politically inopportune. Juggling her interests with those of her mysterious co-conspirators. 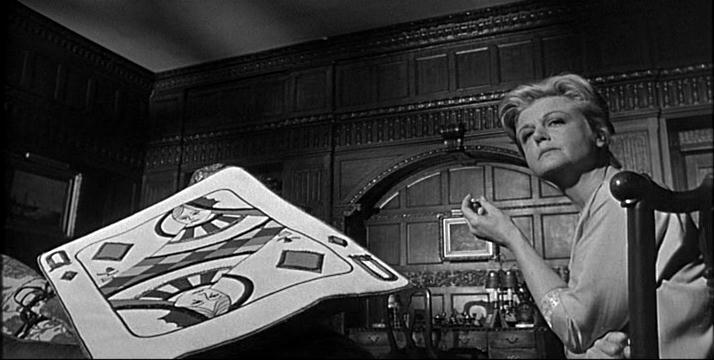 The Manchurian Candidate, besides being a top-notch political thriller, shows us a diabolical Mother-Villain at work. If you haven’t seen this film yet, put it on your Bucket List immediately. The Manchurian Candidate: starring Frank Sinatra, Laurence Harvey and our gal Angela Lansbury. Directed by John Frankenheimer. Written by George Axelrod.M.C. Productions/United Artists, 1962, B&W, 127 mins. This post is part of the Great Villain Blogathon hosted by Speakeasy, Shadows & Satin and yours truly. Be sure to read all the villainous contributions. She really is up there with the top villains. Angela must have seized the role. Not sure about a cool drink of water. Watch out for the cyanide! Yes, watch out for the cyanide! Angela Lansbury is sooo good in this role. I think it’s my fave of all her roles. I really like Angela Lansbury…as a woman, as an actress, as a nice lady with her polite voice and calm demeanor. And then I saw “The Manchurian Candidate” and all of that changed for me. I went from wishing she was my mom, to being sacred of the very mention of her name. Great write-up on a truly terrifying lady. She’s chilling here, isn’t she? I absolutely love her in this role. It’s like she’s not even acting! When I was growing up, Angela Lansbury was all Murder She Wrote and Bedknobs & Broomsticks, so *my* mother set me and my sister right by having us watch her in “Manchurian Candidate.” Made me love her even more. What an actor!! Great write-up. She’s my kind of villain. She’s my kind of villain, too. Angela Lansbury is great in EVERYthing, but this role shows what she can really do. And the fact that she wasn’t typecast after doing this means she’s very smart, too. Oh boy. I have never seen “House of Cards”, but if you’re comparing Claire Underwood to Lansbury, then I should check it out. Yes, Meryl is fab, but in this role she is no Angela Lansbury. Great post. I watched this for the first time a few weeks ago and found Lansbury utterly chilling. I’m so used to seeing her as the good guy, the was a bit of a revelation. I know! We’re so used to seeing her in the “good guy” roles that seeing her in this role is even more disturbing. She almost makes your blood run cold, doesn’t she? Great job, I haven’t seen this for years. I remember when it was released on VHS it was a huge event as it hadn’t been seen since Frankie buried it. Yes, the film was pulled shortly after JFK’s assassination, wasn’t it? And I don’t think it was re-released until sometime in the 1980s? Which is a shame, because it’s SUCH a good movie. Frank had this and Suddenly pulled. Even that is a tight little thriller that offers a great viewing. Oh, now “Suddenly” is one I’m not familiar with. Will do an online search on this. Great review! Angela Lansbury is so fantastic as a villain! Isn’t she, though? I love her in this role, and also as the saucy maid in “Gaslight”. She is perfect as these kinds of characters. Yes, at least Angela Lansbury was nominated for an Oscar…but it was a tough race that year. Isn’t she terrific in this role? I never tire of watching her in this film. I’m with you re: Meryl Streep. She is utterly fantastic, but Lansbury has her beat in this role. I’ve not yet had the chance to read Condon’s novel, but I’ve heard good things about it. Love your post, love your pick. I remember when I first saw this (in the movie theater when it was re-released in the late 1980s! ), I really did not know what the heck was going on. I appreciated that I was seeing something significant, but I think I was a bit on the youngish side to really comprehend what it was. It took subsequent viewings, and especially a recent one, just a few months ago, to make me truly fall in love with this film, the performances, and Angela Lansbury in particular. So awesome. I’m so glad you chose her. Thanks! 🙂 Yes, we couldn’t have a Villain Blogathon without Angela Lansbury. She is so darn good here – as is the rest of the cast. When I saw the DVD on sale, I snapped it up! I saw this for the first time not long ago and must agree that Lansbury is great, though I did find the story rather hard to follow so I’ll really need to see it again. She was only 37 when this came out and just three years older than Laurence Harvey as her son, but she really carries off the role of the terrifying Mother-Villain, as you say! I do also love Sinatra in this. It’s sad but true, your statement about seeing more of this kind of person in real-life politics. It’s actually incredibly depressing. As an aside, there’s a new (Canadian) book that talks about political life (title?) – the authors conducted dozens of exit interviews when MPs left office. Surprisingly, most of them said they never expected to run for office, ever, and they didn’t like how politics were conducted on Parliament Hill. (Of course, this begs the question “Why didn’t they do something about it while they were there?”) Sounds like a very interesting read. Oh boy – “State of the Union” is another one I have to see. Thanks for the recommendation. My favourite Lansbury performance by miles! I came to her via Murder She Wrote and (of course) Bedknobs & Broomsticks, and I wasn’t convinced she could overcome those roles to be a convincing villain – that will teach be to stereotype 😉 I think she makes such a great villainess because she’s able to have two sides to her villainess, making her much more unpredictable and all the scarier for it! I agree with you re: what makes her a good villainess. You just never know when she could snap. You make a good point about that chilling scene where Harvey loads the rifle. I almost can’t watch it. No wonder this film was pulled from distribution! Isn’t Lansbury fantastic here? It’s like you’re watching a documentary of an actual person, not an actress at work. I despise the character, but love her performance. I also admire the fact that she was willing to make herself look older and be filmed with some pretty unflattering light in some scenes. Some actresses are too protective of their image to permit that, but not Lansbury. She did what the character called for. I really enjoyed your review of Angela Lansbury as the villain in the Manchurian Candidate. You did such a wonderful job of actually making me feel how evil she is in the movie. Your comment about her husband also being a “grown man” made me laugh. I have only seen the Denzel Washington/Meryl Streep version so will be watching this one soon. 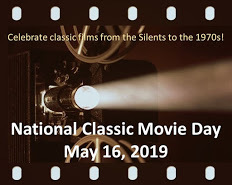 I was a little bit late to the party (the villain blogathon), but have really enjoyed the reviews I read, and hope to go back and read more of them. The villain blogathon was such a great idea, and I am glad you all want to make it an annual event. As good as Streep and Washington are in the remake, it really does pale in comparison to the original. The original film has harsh lights and off-kilter shots that make you feel very tense and uneasy. And Lansbury! She is marvelous! Angela Lansbury is one of the greats, and I think she is doesn’t get the recognition she deserves. You don’t have to know a whole log about classic movies to write about them. Look at me! I just give my opinion!